All the containers are new, wind, water and rodent proof. If we have not got one empty, we will get one in for you. You drive your car or van to our furniture storage unit door to deliver or collect your effects so there is no double handling on and off trolleys, and no lifts or corridors to negotiate.Domestic Self Storage, store all of the below. You can also have use of an electric hook-up – 240 volts AC via standard 16 amp socket. Commercial Storage, Store all of the below. 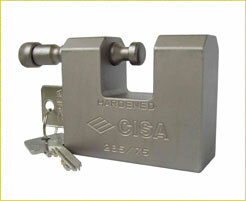 Each of our containers have been fitted wit this type of high security Box Lock. When you rent one of our containers you will be loaned a high security lock. A new 10ft contaner for sizes look at the chart below. A new 20ft container for sizes look at the chart below. On the left a new 20ft container and to the right a used 20ft container.